I just love potatoes and I love cheese, so what better way to put these two favourites together than baking them! Growing up we always had mashed potatoes, with the Sunday dinner, roasted potatoes. Springtime was the time for boiled new potatoes and naturally we would have fish and chips, but baked potatoes were not served that often, usually once a year when we celebrated Guy Fawkes night. However, I think it was in the late 70’s early 80’s there was a baked potato boom with shops opening up with names like Spuds You Like and they served baked potatoes with various toppings. Then all the pubs started serving them up as well and they still do to this day, but it’s not something we have that often at home. Occasionally I get a request when I’m grilling to throw a few boiled taters in their skins, wrapped in foil onto the the grill or on the coals, but they do take up space. So what I like to do is prepare a few in the oven, maybe a large one per person and a couple of smaller ones just in case of big hungers and to be extra decadent serve them up baked with cheese! Scrub a large potato per person or a couple of smaller ones and give the skin a few pricks with a fork and place in the oven 160° for about 40 minutes or until the skins are relatively crisp but the potatoes give a bit when squeezed. Remove from the oven and place on a chopping board. Cut the potatoes in half and scoop out the flesh into a large bowl. Mix in some butter, salt and pepper and pinch of nutmeg until you have a lumpy mash potato mix then stir in a good amount of grated cheese. 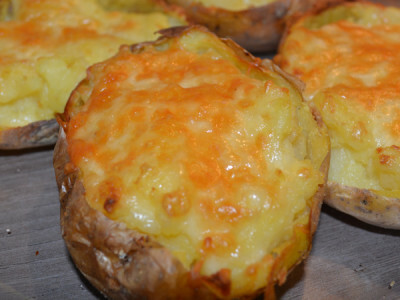 Fill the halved potato skins with the mashed potato with cheese and sprinkle a good amount of grated cheese over the top and return to the oven or grill and bake these until the cheese has melted and is going a nice golden brown colour. Serve with chopped chives over the top! These are absolutely delish!